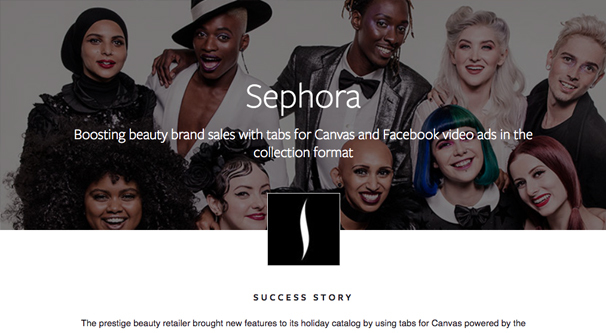 Facebook Canvas Ads are an ad format designed for mobile, but usable on desktop as well. They’re a kind of post ad that loads instantly and includes both photos and videos, carousels, tilt-to-pan content, and even tagged products all in one. At least, that’s what they were. 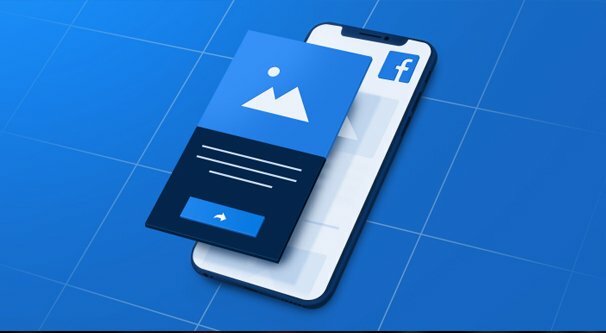 As of September of 2018, Facebook rebranded Canvas Ads into something new: the Facebook Instant Experience. In addition to all the features listed above, the current Instant Experience format automatically uses any Facebook Pixel installations you have on your site, and allows third party tracking if you want to use another analytics suite along with Facebook Insights. Canvas Ads and Instant Experience are the same thing, so I’ll be using the terms somewhat interchangeably. You know how it goes. The fact is, they’re a new enough format and have changed so little over the last two years since they were introduced that all the old content written about Canvas Ads still applies to modern Instant Experiences. Maybe modern ads are a little more sophisticated, taking advantage of more practice in creating such experiences, but it’s still the same core. So here’s the thing. I know a lot of marketers who are fairly well versed in the standard ad formats, like sidebar ads and carousels on Facebook, or page post ads and the standard ad formats. Instant Experiences, though, are a lot more complex. They allow you to integrate half a dozen different kinds of media and ad formats all into one experience, including some that aren’t usually standard for most marketers. It’s easy to be overwhelmed and not know where to begin. That’s why I’m writing this: to give you examples and ideas of how you can use Instant Experiences for your own brand. 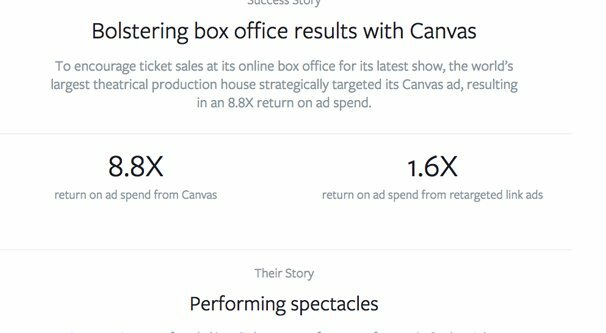 Check out these 20 examples of effective Canvas Ads, and maybe you can adapt some ideas for your own brand. Superbowl ads are a big deal on television, so much so that there are annual toplists and competitions to see who had the best – and the worst – commercial. Prime spots in Superbowl advertising can cost at minimum $5 million dollars for a 30-second spot, so it’s no wonder that brands want to piggyback off that value as much as possible. 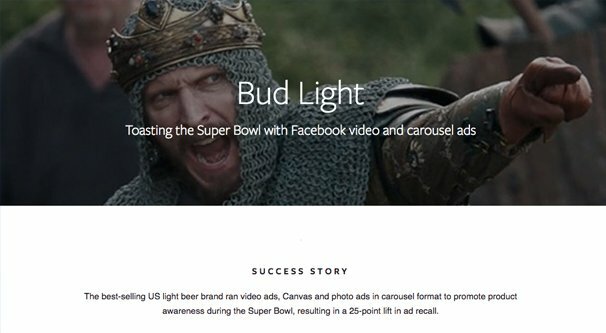 Bud Light ran this Instant Experience ad with imagery, themes, and the branding call they created for use in the Superbowl ad. It was effective, too: they achieved a 4 point life in brand favorability and reached nearly 50% of their total target audience. New Balance may not have the brand panache of Nike or Reebok, but they produce comfortable athletic shoes that get the job done without breaking the bank on brand recognition. This Canvas Ad they produced resulted in a 12-point increase in purchase intent for their new foam shoes, along with a 9-point increase in another related shoe style. 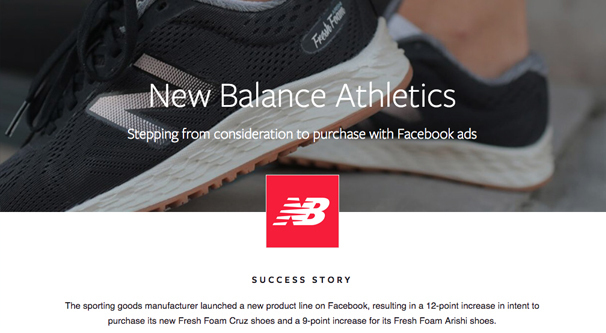 Through this ad experience, New Balance showcases two new styles of shoe in action and with varying styles and colors, complete with direct links to their storefront where users can make a purchase immediately. A popular beauty brand, Sephora nevertheless always has something to advertise. 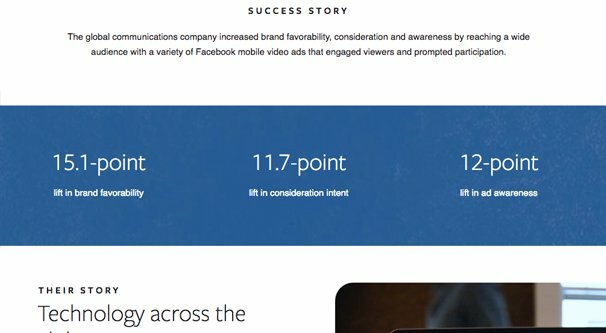 This ad experience brought users to a holiday collection and resulted in a 30% increase in reach, a 41% higher click-through rate than previous campaigns, and a 32% increase in return on ad spend, one of the best metrics to improve. As a beauty brand, it’s no surprise that bold colors and exotic imagery abound within their ad experience. Of course, their ads would be nowhere near as effective without clever use of Facebook custom audiences and lookalike targeting. It should come as no surprise that auto manufacturers are always on the cutting edge of new marketing technology. Vehicles are a rare purchase for the vast majority of people around the world; one purchase can last a decade or more in some cases, and brands want that one purchase to be theirs. Audi took advantage of the Collection format for their Canvas Ads, which acts sort of like a carousel ad with additional media formats and full mobile screen coverage. 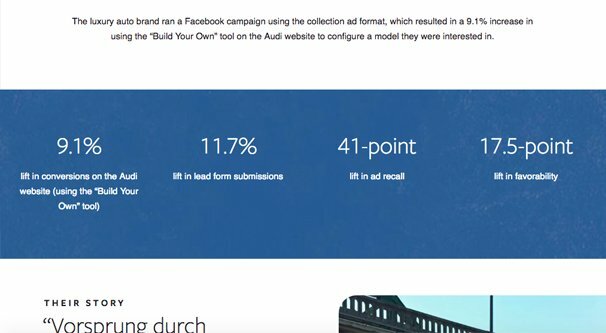 All in all, the image of luxury came across, giving Audi a huge lift in recall and favorability, as well as a 9.1% lift in conversions using their “build your own” vehicle tool. Second of several auto manufacturers on this list, Jeep launched their updated line of Grand Cherokee models using canvas ads. 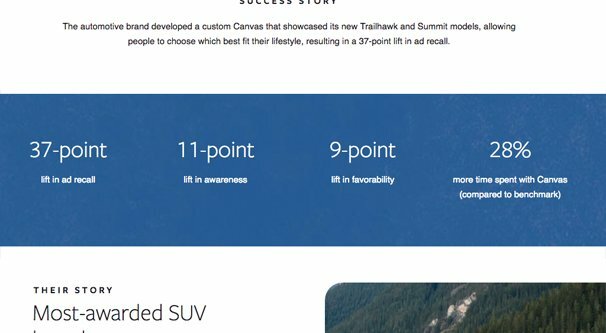 The two new models, Trailhawk and Summit, gained a large lift in both awareness and brand favorability, with a 37 point increase in ad recall. Jeep used the variable media format of the Canvas Ad to allow uses to pick between the two new models, pushing different benefits for different lifestyles for each. Think of it like a “choose your own adventure” format for advertising multiple products simultaneously. One of the larger chain Asian restaurants across America, P.F. Chang’s put the Facebook ad format to good use. They also used one of the prime Facebook ad formats we all know and love as an incentive: the contest. 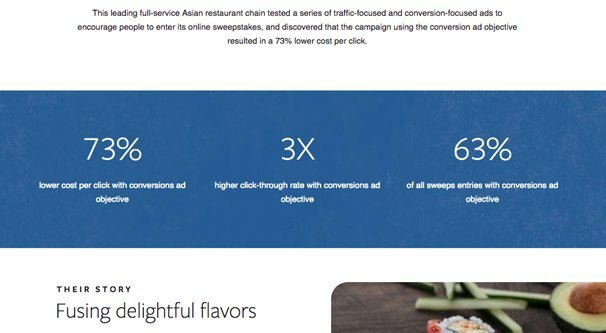 They created a Farm to Wok sweepstakes with a conversion objective to maximize their results for the money. Winners got to visit Napa Valley, a prize anyone would want to shoot for. The results speak for themselves, with a 73% lower cost per click and a 3x higher click-through rate. 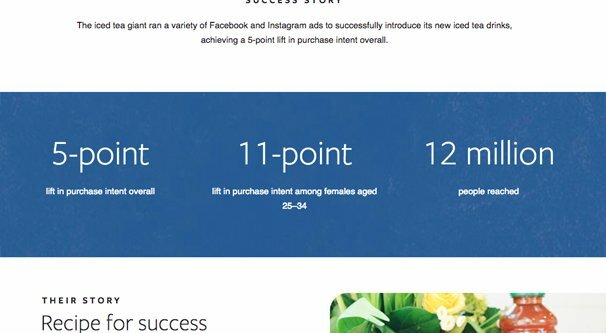 Their campaign included the Instant Experience, as well as video ads on Instagram to reach an even larger audience. CenturyLink may not be in the news quite as much as its big brothers ATT and Verizon, but it’s still a telecom monopolist worth tens of billions of dollars. They used a combination of Canvas and Carousel ads recently to promote their brand with videos and encourage participation. The ads focused on the rural roots of the massive corporation, and managed to overcome the generally negative impression of telecoms in this country. It resulted in a raise of 11.7 points in consideration and 15.1 points in brand favorability, much to the pleasure of people like Ajit Pai. I don’t know about you, but I doubt it took very long for the marketing execs at Nestle to decide on Nestea as the name for their tea brand. The iced tea brand introduced new products and a brand revitalization using Facebook and Instagram ads, including Canvas ads. It’s always a risk when a beverage changes its formula, part of why Coke has kept theirs secret for so long. Nestea has been around since 1947, but last year they performed a total rebrand, including changing the formula and logo for their teas. The ad campaign supported this by raising purchase intent, reaching millions. In case you’re not familiar, Popeyes is a primary competitor to various fried chicken brands like KFC and Lee’s. 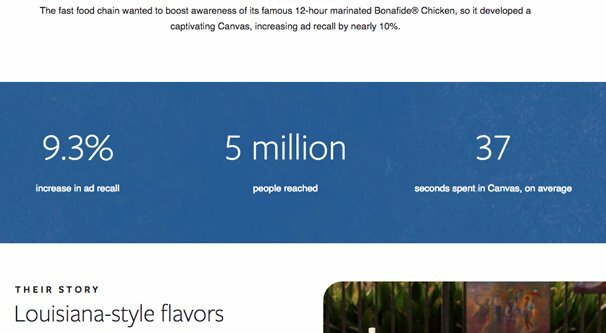 They wanted to raise both brand favorability and awareness of their 12-hour marinated chicken, so it used Canvas Ads to great effect. You know, I’m sure, how hard it is to capture user attention with advertising. It’s hard enough to get a click, let alone any sustained attention. And yet this Popeyes Canvas had an average engagement length of 37 seconds in their Instant Experience. It might not sound like much, but when other brands are averaging under 5 seconds, it’s an incredible achievement. There’s nothing hugely unique about the concept of buying in bulk or on a subscription to save costs overall. Dollar Shave Club has taken the shaving world by storm with clever advertising and branding more than anything else, and have been slowly expanding their line of personal care products beyond just razors. 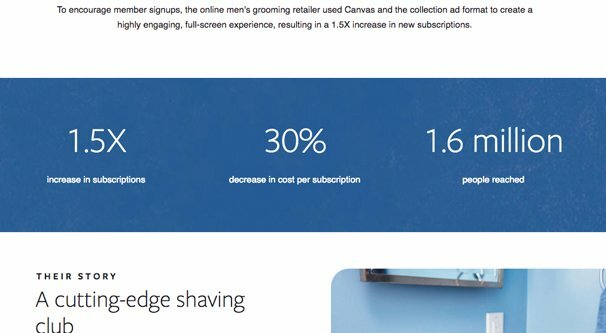 Using Canvas ads, DSC was able to create a robust and engaging experience for users, resulting in a 1.5x increase in subscriptions while the ad ran, with a 30% reduction in cost per subscription. Not bad when you consider they reached 1.6 million people with the campaign. Another auto brand made the list, as should be no surprise. In this case, they combined two advanced features of Facebook marketing. One is the Canvas Ad, showcasing an experience users could have with their vehicles. 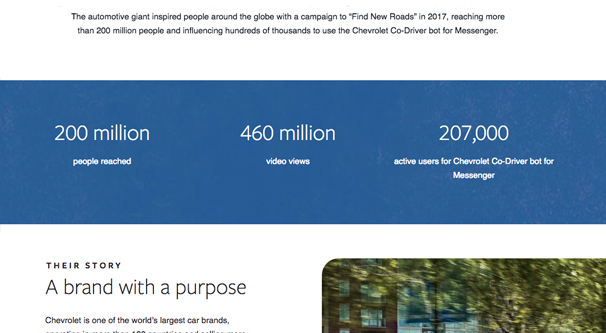 The other is the Chevrolet Co-Driver Bot, a Mesenger bot that used themes from their Canvas ads to help motivate and inspire those who contacted the brand. Not a brand you may have heard of before, Tilting Point is a partner for indie game developers. 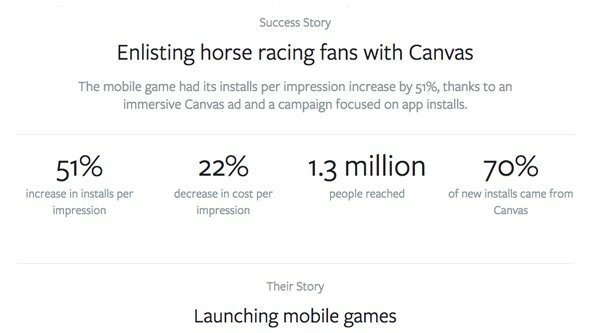 With the release of a new game they published, Photo Finish Horse Racing, they used the Facebook Instant Experience to showcase how the game would play. In addition to attracting the fans of horse racing already present, they included a one-tap visit to the app store, allowing users to get the game immediately. In a time where medical costs are spiraling out of control, something simple like Halls cough drops are an indispensible need for many. 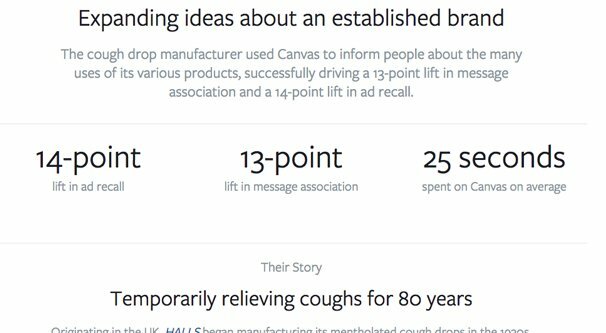 Their canvas ads engaged users for an average of 25 seconds each, and included a 14-point increase in ad recall by the end of the campaign. To do so, they encouraged users to use their product outside of the height of cold season. You wouldn’t normally consider the State of Montana to be a brand, and indeed you would be right. Yet modern tourism boards treat states as brands for the purposes of showcasing the unique experiences and venues you can visit while in the state. The Montana Office of Tourism and Business Development, or simply Montana for the purposes of this paragraph, used Canvas ads to build up tourism to the state. 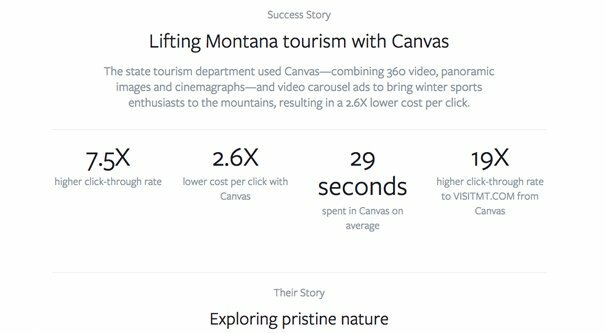 The ads resulted in a nearly 30-second average engagement and a bump in tourism, particularly among skiers. Cirque du Soleil has never had a problem with imagery; their stunning displays of gymnastics and acrobatics in carefully choreographed shows have always been exotic and highly imaginative. To promote their most recent show, Paramour, they turned to Canvas ads to showcase themselves in motion and explore the themes of their new show. I’d say it worked: they achieved an 8.8x return on ad spend, along with a 1.6x return from a retargeted ad audience. Through it all, they drove ticket sales directly from their ads. Airbnb may have had some issues with abuse in the past, but their brand nevertheless allows a wide range of tourism options for those with smaller budgets, who would otherwise find it difficult to rent out hotels. 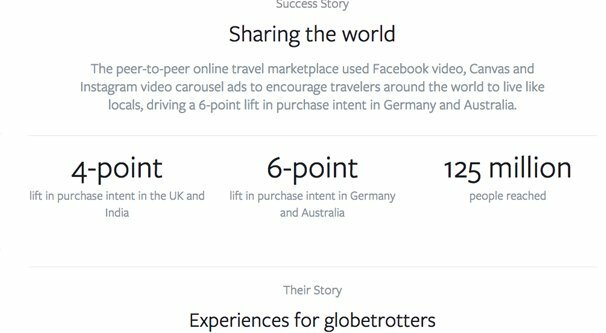 This ad campaign took advantage of Facebook’s global nature, with targeting in the UK and India resulting in a 4 point increase in purchase intent, and a 6 point increase in Germany and Australia. They reached 125 million people with their Canvas ads, too. One of the wonders of modern capitalism is the proliferation of subscription services with what is more or less a mystery inside. Everything from LootCrate to BarkBox provides monthly deliveries with treats for the people who order – and their dogs, in this case. 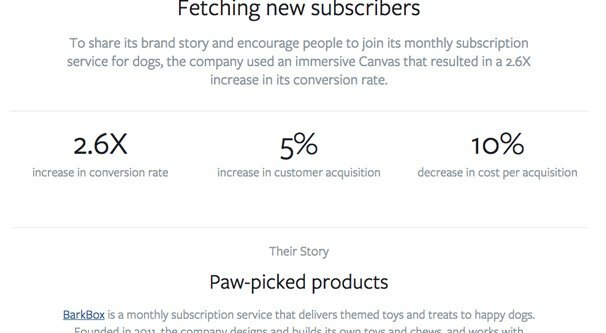 BarkBox delivers a curated collection of treats and toys to subscribers, and bumped up their customer acquisition by 5% as a result of this inspiring Instant Experience. Wearable tech is perhaps the next big thing, with everything from the Fitbit to Google Glass trying to find a successful niche. Wearsafe is a piece of wearable tech aimed to help combat assault as an alert system for family and friends, along with mobile pairing to provide information to emergency responders. 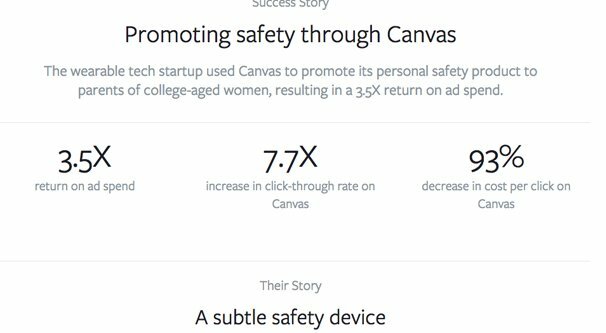 With back to school sales and an emphasis on college safety, especially for women, Wearsafe ran a series of Canvas Ads and saw a 93% decrease in cost per click for their ads, as well as a 3.5x return on spend. 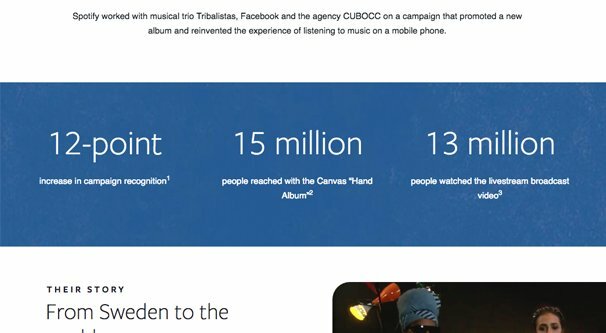 The Brazilian branch of Spotify’s brand worked directly with a popular music group, Tribalistas, and an ad agency to promote their new album. Through this pairing, the group saw a large bump in recognition and reached 15 million people, with 13 million people watching their livestream to promote the album. Not bad at all. One of the largest game companies in the world, Nexon used Canvas ads to promote several of their free to play games, aimed at reaching the high value returning customers that keep such games alive. 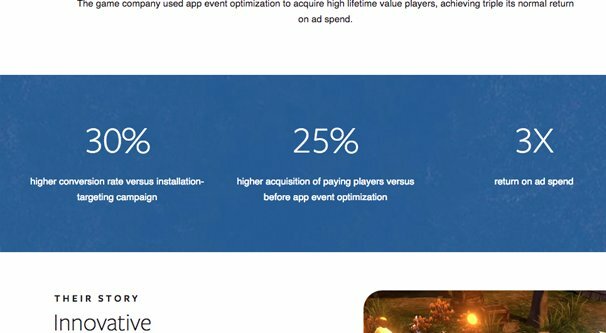 They saw a 3x return on ad spend to promote the game Heroes of Incredible Tales, which is incredible when you consider plenty of people have no need to even spend money on the game.